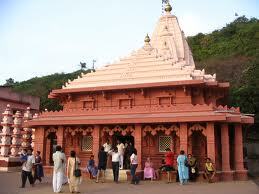 The Ganesh Temple at Ganapatipule in Ratanagiri district of konkan is very ancient, right from the time of Peshwas. It is located at a distance of 350 kms from Mumbai. In ancient literature like Mudgal - puran etc. this ' Siddhivinayaka's (Ganesh) temple is being referred as “Paschim Dwar- Devata “(Western Sentinal God) various myths are prevalent about the temples and deity in Konkan. Ganpatipule is one of the" Ashta Dwar Devatas" or the “Ashta Ganapatis” (Eight Welcoming Dieties) of the subcontinent and is known as Western’s Sentinel God. During the reign of Moguls, there was a' kevda' (Flower tree) Jungle at the foot of the hill where the temple of the 'Swayambhu' Ganapati is presently situated. Ganapatipule derived its name from “Ganapati" or the Lord of "Ganas"(army) and Pule' which means sand dune. This place is a famous pilgrimage centre too. Many devotees have generously donated to the Deity, the daily activities at this holy centre, festivals and many other programmes carried out at Ganapatipule, a place of scenic splendors at the western coast of India. Let all the people who visit this place be able to be a part of the various activities of Lord Gajanana undertaken here and let the all -Pervading God who is the rescuer of the earth shower His blessings on all to make them prosperous. Sparkling blue waters, endless stretches of golden or silver sand, sun beams dancing through the swaying palms, waves playing with the sand dunes, a cool breeze whispering sweet nothings in your ear. This is the land of Ganpatipule, one of Maharashtra's almost virgin beaches. Nestled in the greenery is a nearly 4000 year old landmark the Swayambhu Ganpati Temple (Swayambhu means a self-originated idol, Ganapati). It is flooded by thousands of devotees and tourists every year.. Ganapatipule is a small village, serene, sedate and unspoilt. The beach here is still natural and pristine as ever. And travelling by road is an experience by itself. The vast 'Konkan stretch abounds with scenic greenery There are narrow mud-roads, the earth is red and the roofed houses with clean courtyards add a quaint touch to the panorama. The local vegetation includes fruit-bearing trees like mango, betelnut, banana, jackfruit, coconut etc. The entire western coast is covered with these trees. The locals are as warm and cheerful as their surroundings. Ever ready to chat with the visitors and make them feel at home. These god-fearing local devotees take a "Pradakshina" around the hill where the temple is located, not just around the temple. Pradakshina is a form of showing obeisance. The devotees walk in a circle around the idol of the Lord or around the temple, (the house of the Lord).